The closing ceremony of Turkey’s 4th international Quran recitation and memorization competition was held in Istanbul on Friday. During the ceremony, which was attended by Turkish President Recep Tayyip Erdogan, winners of the two categories were announced and awarded. Somalia’s representative Omar osman Ali winned the third place in the category of memorization of the entire Quran, the Bangladeshi memorizer bagged the top prize while those from Tajikistan, and Palestine came second and fourth. Somali's representative Omar osman Ali who won a few weeks ago the first place in the the Holy Quran Competition in Somalia had a good performance and was expected to win a title. The international competition, which started at Istanbul’s Fateh Mosque on June 11, brought together 89 reciters from 55 countries. 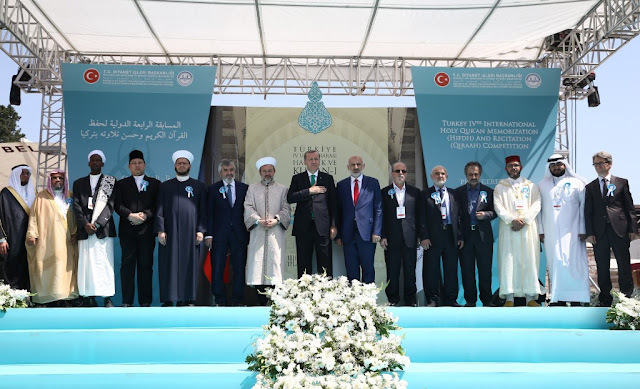 Turkey’s top religious authority, the Presidency of Religious Affairs (Diyanet), organized the event.